A microscope is a device that is used to see things too small to see with the naked eye. There are many types of microscopes. The most common type is the optical microscope. An optical microscope is composed of a magnifying lens and an eyepiece that are joined together in a tube, an illuminated stage where the object being observed is placed, and a tripod to secure the optical components. The source of light for an optical microscope is generally a small bulb attached to a tripod with a lens or system of lenses that can be adjusted and fixed behind the illuminated area. A microscope condenser is a complicated system of lenses or mirrors that reproduce the light on the surface of the object. A microscope lens amplifies the object so that the magnified image can be viewed in the eyepiece. A microscope with two eyepieces allows the user to view the object more comfortably and with greater accuracy. Another type of microscope is the electron microscope. An electron microscope works on the same principle as an optical microscope, but uses electrons in the place of light and electromagnets instead of glass lenses. Due to the fact that the wavelength of an electron can be up to 100,000 times shorter than that of a visible light photon, an electron microscope has a higher resolution power than a light microscope. Therefore, an electron microscope can reveal the structure of much smaller objects. The ultra-microscope is another type of microscope, the ultra-microscope has the capability to measure very small particles. In the ultra-microscope, the materials to be observed are dispersed in a liquid or gas colloidal suspension. Then the colloidal suspension is placed in a light-absorbing, dark enclosure, and illuminated with a convergent beam of very strong light that enters into the enclosure from one side. The light hitting the colloidal particles will then be scattered, and the tiniest particles can then be viewed with incredibly high resolution. There is also the scanning probe type microscope, in which the microscope forms images of surfaces using a physical probe, or series of probes, that scans the specimen. The scanning probe microscope has the ability to measure physical properties such as conductivity, static charge, friction, electromagnetic fields, and modular elasticity. The scanning probe microscope has the ability to create 3D images of items. The PCE-MM 800 microscope is designed to display simple magnifications on a computer screen. For this purpose, the PCE-MM 800 microscope is connected to a screen. This allows a large presentation visible by several people. PCE-MM 200UV is a UV USB microscope, or UV USB inspection camera, that magnifies objects up to 200 times. This UV microscope uses 8 UV LEDs with a wavelength of 365 nm for illumination. The microscope captures photos and videos as well as displays magnified objects in real time on your computer screen. Thanks to the integrated 7.62 cm / 3" TFT color display and Li-Ion batteries, the microscope can be PC-independent and therefore used completely mobile. Equipped with 8 white LEDs increases the microscope up to a 500-fold size and thus captures even the smallest details in image or video. The microscope PCE-WMS 100 is the ideal aid for repair and service workshops. Thanks to the movable camera arm, the camera can be precisely aligned by the microscope on the object to be optically examined. 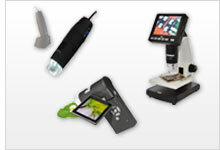 The Full HD Microscope PCE-VMM 100 is used to zoom in on components, assemblies and many other items. The PCE-VMM 100 HD Microscope is a reflected-light microscope with an enlargement of up to 206x. The mechanical 3D microscope PCE-IVM 3D can be used for reflected light and transmitted light microscopy and therefore allows the creation of three-dimensional representations of the objects. This 3D mechanical microscope that allows object to be checked all around thanks to a mechanical mirror (360°).